Lots of people dream about going to visit the Holy Land; to see where Jesus lived and preached and prayed, or to visit and venerate various holy Jewish and Muslim sites. Oddly enough, I never dreamed about it. I never put it on a "bucket list" or thought, "I'd love to go one day," because I figured it would never happen. I guess I just didn't want to get my hopes up, but sometimes God dreams for us. I suppose that's how I ended up traversing one of the holiest places in the world for about a week and a half. A very generous (and anonymous) donor decided to gift our religious community with a large sum of money. The stipulation, however, was that it be used toward the spiritual development or benefit of our Sisters. Together, our Provincial Council decided that the money would go toward pilgrimages to the Holy Land. Obviously they wouldn't be able to send everyone, so they decided to do a lottery. Our annual gathering was coming up, so it was announced that when we were gathered, those who were interested needed to put their names in a jar before the final day of the gathering. We were told, "Four Sisters will be able to go, but we will draw only two names. Each of the two Sisters who are chosen will then be able to choose a Sister companion to go with them." Why not? I thought. Might as well give it a try. I slipped my name in and then forgot about the drawing all together. When the day of judgement came around, our Provincial Minster stood on stage with the jar. Fireworks started going off in my chest while simultaneously my lungs decided to quit on me. "Calm down!" my brain said. "You're not going to win anyway, why get yourself all worked up. There are hundreds of names in that jar." In the midst of my positively negative self-talk, the first name was drawn. Hundreds of names, literally, and the first name read was mine. Yes, straight out of the Provincial Minister's mouth I hear, "Sister Desiré." There was no mistaking it. I'm the only Sister Desiré! My whole body jerked as my hands flew up to cover my gaping mouth. And then, even better than hearing my name called, half the room stood up immediately - in a room of approximately 300 Felician Sisters - and began to cheer for me. Like I said, sometimes God dreams for us. I wish I could go into detail about everything we did and saw, but you didn't sign up to read a novel right now and I didn't sign up to write one. I'll share as much as I can, but mostly I'll share the highlights and the moments that meant the most to me. First of all, let me just wow you by saying we spent our first three nights in Nazareth. It still baffles me to think that I can now speak personally about places I'd only ever heard of in the Bible. Staying in Nazareth brought me close to one of the most important stories Scripture has for us: the Angel Gabriel's visit to a young virgin. I have read the story of the Annunciation plenty of times in Luke's Gospel (Luke 1:26-38), and I pray with one of its passages every day during evening praise as my community recites the Magnificat. Who knew that I'd be sleeping in a hotel less than a block away from such a historically and spiritually significant spot? Since we stayed three nights there, I stopped in the Basilica of the Annunciation every night to pray just so I could be near it. Of course there's a huge church built up all around the site, but they have preserved the humble dwelling of so prominent a family. I would stare at its stone walls and wonder about all the activities that went on there. Was I looking at Mary's actual bedroom? Was I looking at the kitchen where her mother, St. Anne, would have been busy working to nourish her family? Or maybe there was no separation and every room ran into each other, just small corners making up one whole. I'll never know, but what fascinated me even more was being so physically close to the place where God began to weave Himself from the fibers of humanity. I was reluctant to leave, but as always, the best was yet to come. We departed from Nazareth and took a bus to Palestine. The days ahead featured visits to Jericho, Bethany, Bethlehem, the Jordan River, and the Dead Sea. Again, I couldn't believe it. So many of these names had once been untouchable sacred sites in a faraway world found in a miraculous Book. It was almost unreal. Our trip to Jericho was brief, but it remains one of the most profound moments during the entire pilgrimage. We had arrived at the church where we would be having Mass for the day, but the group ahead of us was not yet finished. "We still have about twenty minutes until their done," our group leader told us. "It's not on our list of things to see, but the tomb of Lazarus is just up the street. If you take a left out of here you'll see the man standing outside to collect your money. It's $2 to get in." We all looked at each other and nodded in agreement. "Two bucks, why not?" Although the raising of Lazarus is yet another powerful and prominent story from Scripture (John 11:1-44), I never really had a personal connection to it. I really just wanted to see his tomb because it was there and I could say that I went. Up the hill we walked, all 24 of us, to pay our two bucks. We stepped inside, one by one, and shuffled down some very narrow and steep stone steps. We were greeted at the bottom by a tiny doorway through which we basically had to crawl. Each one came in, took a photo or two, touched the walls, and then turned to go. It was our seventh day on the pilgrimage and we had been moving from site to site so quickly that I had been longing for some stillness and quiet. After everyone had left the small space and I was left standing alone in Lazarus's tomb, I poked my head out and told my friend I was going to stay and pray a little while longer. She made her way back up with everyone else and I stood there in the emptiness. I sat down near the small doorway and looked around, imagining the darkness that would have surrounded Lazarus there. It wasn't hard to imagine since the little light inside was fairly dim and the silence was absolute. I realized that I was in yet another place where holiness broke into our helplessness. Not only did Jesus stand in this place, but He wept here. He cried with us and for us, and then He prayed so fervently that His friend was called back to life. This was a personal miracle. This was someone Jesus knew and loved, and a moment in which He felt His humanity. If anything could show me that God is not far from us, this would be it. Although it may seem somewhat unrelated to the religious nature of this trip, I thoroughly enjoyed our visit to the Dead Sea. I had been going back and forth in my mind as to whether or not I would swim in it. Finally, like my rationale with so many other decisions, I figured, "Why not?" I suited up and walked down to the water's edge. As I stood there looking over its surface, it appeared to be just like any other body of water, but underneath I knew it was different. The Dead Sea, known for its high salt content, cannot support marine life. As a result of its salt levels, it is also unique in that items which cannot usually float in water are suddenly able to - like humans! This helped me with my two very real fears of large bodies of water: the fear of creatures biting my limbs off, and the fear of drowning. I walked in slowly, watching others splash around on their backs, so when I finally had water up to my waist I decided I would give it a try. I lifted one leg, then the other, and that was all it took; with hardly any effort I was lying on my back in the shallow waters of the Dead Sea. With that one swift motion, my fears disappeared. I marveled at the fact that there was nothing to be afraid of, that I didn't have to wonder about what was below the surface or if I would be able to survive the pull of unknown currents. I drifted out as far as I could go and lifted my face to the sun while my arms and legs gave themselves to the movement of the water. Pure freedom. Even now I am drawn back into that place of calm as I re-imagine the experience. It's a gift that I will never forget, and one that I hope to recall in times of turbulence and fear. God's love is even more abundant than the salt that carried me beyond fear; if salt can keep me safe, how much more safe is the love of God - infinitely able to lift my soul beyond the fear of pain and death. Continuing the journey, we departed from Palestine and entered the city of Jerusalem where we stayed for the remainder of the trip. While in Jerusalem, I was able to set foot and heart upon another set of holy sites, including the Basilica in which Calvary and the tomb of Jesus have been preserved. One of my favorite experiences took place at the Church of All Nations which sits over the Garden of Gethsemane and houses the stone upon which Jesus is said to have prayed during His agony. We actually visited the church twice, going there a second time for a late night Holy Hour. As the Blessed Sacrament was exposed, I knelt at the railing near the altar with the stone at its base. I tried imagining the stone in its original setting and pictured the garden that was outside the church. "This must have been a beautiful and comforting space," I thought. It brought to mind all the times I had sought out a comforting place or person when I knew I needed to cry. Perhaps Jesus came here with His closest friends because He knew He needed to cry. We see Gethsemane and the garden as a solemn and somber place, but maybe it was different then. It's somber now because we know the rest of the story - because we know that Jesus wept there and was betrayed there - but before all of that, perhaps it was a cozy place to pray and Jesus knew it would comfort Him to be there. Suddenly, I felt like I needed to cry. I couldn't understand why, so I closed my eyes and pictured myself with Jesus in the garden. Kneeling beside Him at the rock, He looked into my eyes and said, "It's okay, you can let the tears come." Then, lifting His hands to my face, He gently placed His thumbs over my eyes. I immediately began to cry real tears. I tried not to let my face fold into the sadness that had just taken over, but I couldn't help it. I felt now that I was no longer there to comfort Jesus in the garden, but that He was there to comfort me, sharing with me His sacred space. Just as He did during His agony, I cried out to my Father, not sparing the pain welling up inside me. I felt united with Jesus, as though He wept with me not only in the moment, but even when He had wept in the midst of His unfolding Passion. It made me realize just how connected Jesus's life is to ours. Jesus may have walked the earth over 2,000 years ago, shedding tears and sharing joy, but God is timeless. God's life on earth continues, and is especially real because Emmanuel - God-with-us - enfleshed and redeemed our humanity. As Advent makes its way into our homes and our hopes this year, my prayer for us all is that we not only long for God's renewed presence among us, but that we also recall how He has been and remains present to us. Your tears are His and your joys flow from His heart; may you know during this special season and always just how present God is to you, and when you are able, may you remain present to God by being compassionately and boundlessly present to others. 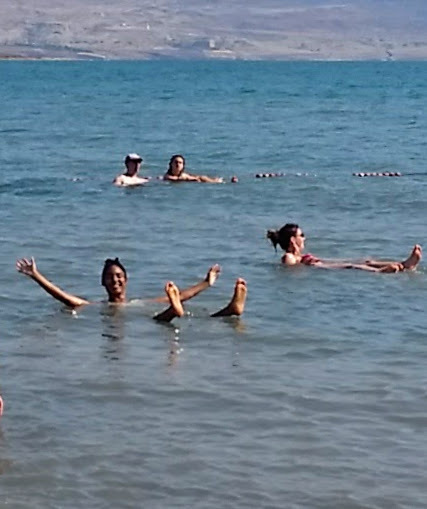 Fearless in the Dead Sea! My heart is all over the place. It goes from celebrating my new ministry and home with utter joy, to missing my Sisters and students in Pomona, to mourning over lives lost in catastrophe and violence. Individuals and entire countries settle in my being wherever they can find room, and usually without warning. Sometimes it hurts; sometimes it feels like I could never be happier. As I get ready to go to the Holy Land where Jesus spent His very short time on earth, I wonder if He sometimes felt the same. I bet Jesus’s ministry brought Him great joy, especially when He could see how people’s lives were changed once He healed their spiritual or physical ills. Jesus had very good friends and people He loved that I’m sure He was sad He couldn’t always spend time with. And I’m sure first-century Palestine was no stranger to natural disasters or violence either. So what did He do with all that emotion? Sometimes He wept, like when His friend Lazarus died. Sometimes He celebrated, like when He ate and drank with the disciples. One thing I noticed is consistent, though: Jesus prayed. Sometimes He prayed alone, sometimes He prayed with others, but He always prayed. Both of my new ministries are extremely life-giving for me. My main ministry is what we call “vocation ministry”. It involves a lot of travel. I have plans to attend a lot of different youth and young adult events, but it also includes creating my own events and putting together prayer services or meaningful experiences for those who wish to grow in their relationship with God. I’ve already gotten to facilitate a Come and See weekend where three women who were interested in religious life came to pray and visit with our Sisters in Canada. I will be going to a day of discernment at Franciscan University this week to share about our Felician community with college students who may feel called to discern religious life. In the meantime, I’m also working on a camping retreat to be held next February with women between the ages of 18 to 35. It’s the best kind of busy I’ve ever been. Every day is different and every assignment that comes my way is like a Christmas present I can’t wait to unwrap. I wonder if Jesus felt the same as He moved around from place to place, responding to His Father’s love and purpose for Him. I can only imagine that Jesus loved His ministry, and so must be sharing that joy with me as I continue to respond as best I can to God’s love and purpose for my life. Not only do I get to work on all these fun projects, but I also spend time at an after-school program in a neighborhood that struggles with poverty and substance abuse. So far I’ve been helping the kindergarten and first graders with their homework. I must admit, I was terrified when I initially received this assignment. I thought, “No way, Jesus, You’ve got to be kidding me. I work with high school kids. This is not my crowd.” He didn’t say anything of course, He just let me go in there all pale and petrified. Except, I discovered, He gave me the grace to do exactly what I thought I could never do: work with 5- and 6-year-olds. Now, don’t let me fool you into thinking they’re angels. No, no, they punch each other and run around when you ask them to sit down and quickly find ways to get out of doing their homework; BUT they are so darn lovable, and they really just want to be loved. I wish I could give each of them the one-on-one attention they deserve, but I do my best to give them attention however and whenever I can. I got called “mommy” on the first day, and now I proudly claim them all as my babies. Is this how Jesus felt about the “little ones”, the ones who probably fought for His attention, wanting to sit on His lap or curl up under His arm? No wonder He said the kingdom was made up of children and those who were like them. They’re so full of love! Their affection is so pure and so sincere, I can see why He calls us to be like them. Enjoying my ministries as much as I do does not mean that the people I love in California have been replaced. Enjoying my new home and ministry almost makes me miss them even more, as I wish I could share all this new life and excitement with them. It helps that my students and friends still keep in touch with me, whether through Instagram, texts, or letters, but I miss them even then. I can say, however, that in a way all my Californians are still with me. I couldn’t love the kids I work with now as well as I do if I hadn’t learned such love during my time in Pomona. I’m able to be stern when I have to (which with 5- and 6-year-olds means reminding them to say “please” and “thank you”) while knowing that I do so because I know they are capable of greatness and understanding human dignity. I am also able to collaborate and share ideas with leaders and colleagues now because I had so many wonderful mentors, co-workers, and friends in California. Perhaps as Jesus travelled from home to home He felt a tinge of sadness too, not knowing when or if He’d see certain friends or families again. As each family and community welcomed Him, He was probably reminded of all those who had lovingly done the same in years past. Maybe He wondered how they were doing, maybe He asked about them from time to time. Either way, I bet He never forgot about any of them. With this latest act of domestic terrorism, I can’t help but think of all the family members and friends whose lives were forever changed in just one night. Unless we have a family member or friend suffering with a life-threatening illness, most of us don’t wake up and think, “This might be the last time I see them.” When tragedy like this happens, I am reminded of how unpredictable life is, and of how deeply painful loss can be. I can’t say I know what any of the families and friends who lost loved ones on October 1st are going through, but I do have a certain sense of what sudden loss feels like. In my own family, we experienced a sudden loss of sorts without any kind of warning. It shocked all of us, and the lives of those involved were changed forever in an instant. We continue to grieve, even in the midst of hope, because nothing has been the same ever since, and nothing will ever be the same again. It’s made some of us question our very worth, wondering how God could let something like this happen. I wonder if that’s how Jesus felt when He cried out and asked why God had abandoned Him. I think most of us have asked that of God for some reason or another: “God, why have You abandoned me?” In other words, “Where were You when I needed You? Why didn’t You do something to keep this from happening?” It feels like a crucifixion, like the world has destroyed us and we’ve been left to suffer unbearable pain. Jesus experienced this in His very body as He suffered from an act of terrible violence. He is no stranger to our pain, physically or emotionally. Prayer can open any door. It can open the door to a deeper sense of gratitude, a call to action, to healing and forgiveness. What is it you’re looking for in life right now? Because I can guarantee you it’s behind one of those doors, and you’ve already been given the key. I am going to be speaking this weekend at the National Black Catholic Congress in Orlando, Florida. I was asked to give a presentation on prayer and was given the title "Prayer: Our Greatest Weapon". My lack of self-confidence quickly led me to wonder what in the heck I could offer on this topic that would be worth sharing. I started to look up quotes and think about books that I knew could say a lot about prayer; I tried making an organized PowerPoint with images and words that would do the trick; I even thought about doing a survey in my convent of what the other sisters had to say about prayer; but then I stopped. I realized that even though I didn't believe in myself, God did. I didn't sign up to be a presenter at the congress. In fact, they had to ask me twice because I turned them down the first time. I may be stubborn, but God is persistent. For whatever reason, God chose me to speak on the topic. The other mistake I made, aside from thinking I should use everyone else's words, was the idea that God wanted my thoughts on prayer. One of my spiritual directors once told me I was in my head too much, that I needed to let my heart move me once in a while. When I was working on writing a book with several other sisters over Christmas break this past year, that message was reiterated. We would break off into small groups every day to share our progress and provide feedback for one another. One of the sisters whom I admire very much gave me this critique: she said that I was a storyteller and that it was a unique gift. She said she was intrigued by everything I had to say until I stopped telling the story. When my part of the book became academic, she confessed that she lost interest. I realized it was because I started relying too much on my "head" and started trying to write without relying on my heart. My gift is not in academic writing I discovered, it is in sharing stories. Since this blog enables me to tell stories in my own words and through the experiences of my heart, I figured it would be the best way to prepare my talk for this weekend - so here are some stories of prayer. This summer I was able to return to the 100-mile pilgrimage I used to walk annually before I joined the convent. (It's actually how I met the Felician Sisters.) Every year, hundreds of pilgrims walk from designated cities around New Mexico to a small Marian shrine known as the Santuario de Chimayó. There were four groups walking in total this year and I was on the women's route walking from Albuquerque. So why do I bring up pilgrimage other than the fact that we were walking to a place of prayer? While it's true that we prayed together every day, morning, noon and night, that's not even the reason I bring up my experience of pilgrimage. I bring it up because we had become prayer. Walking 100 miles is no joke. It's extremely taxing on your body, even if you train for it. The altitude can get to you because the air is thinner; the heat can get to you, especially when there is no shade for miles; dehydration is always a threat; shin splints, blisters and cramping often show up within the first day or two; and then there's just the general soreness of achy muscles because no one's body is used to walking 20 miles a day for five days straight. That's how we had become prayer - we had opened up our bodies to extreme physical discomfort, not because we thought it was a good idea, but because we welcomed whatever the journey would bring and we did it for others. There's a quote by Arthur Ashe that says, "Success is a journey, not a destination. The doing is often more important than the outcome." I want to paraphrase that in terms of the pilgrimage: Prayer is a journey, not a destination. The effort is often more important than the outcome. On the pilgrimage, it was our desire to keep on going and our fidelity to the journey that transformed us. Most importantly, everything we did, we did for others. The journey and the determination to continue was for the sake of the people who had entrusted us with their prayers as well as for each other. Sometimes prayer was ignoring our own pain so we could comfort another, giving tissue to a tearful companion, or offering our suffering for the family and friends we had promised to pray for. Because it was so physically taxing, and because we did it all out of love, we carried prayer in our very bodies. That's called sacrifice, the highest form of loving one another that Jesus Christ explained and exemplified. And what is the result? Why should sacrifice mean anything to us? It transforms us. It brings us closer to others and closer to God. So often my prayers are about what I want or what I need God's help with, but in sacrifice it becomes all about how I can be of service to others. That's what prayer is for - transformation, becoming more like the images of God we were created to be. Are we not called to be perfect like our Heavenly Father is perfect? We will likely not reach absolute beauty and truth in this lifetime, but again, it's about the journey not the destination. Another form of prayer has been my recent interactions as I prepare to leave Pomona, California after four years here. During that time I formed many friendships and became a part of many families. It hurts to leave, but I cannot explain how grateful I am to have lived and loved here. The "goodbyes" started at the end of the school year, but they continue as I go out to lunch with a colleague or grab some ice cream with a former student. The other night I was invited to dinner at the home of a family I got to know through teaching. I arrived at 5 p.m. and was greeted with smiles and kindness before I even rang the doorbell. Along with the conversation and company, I enjoyed a wonderful homemade meal, dessert, and several glasses of water. Everyone was so gracious and genuine. We talked and laughed like we could go on all evening, but I eventually confessed that it was probably time for me to go. They walked me to my car and we hugged goodbye, but we promised it wouldn't be the last time we saw each other. As I turned the key in the ignition, I looked at the clock and almost started laughing. It was 2:23 in the morning! I had been there for nine hours and the conversation might have even continued had I not decided to go home. I almost couldn't believe it, and yet I could. The whole time I was at their house I had not been worried about what time it was. I wasn't repeatedly looking at my watch to check the time, or wondering when there would be a break in the action so I could leave. It was like I had experienced time the way God does. Our time together that night became a prayer because each of us was living in the present - each of us was content to simply be there with one another. We weren't thinking about where else we could be or what else we could be doing; we were simply being. That's not easy. I know I often find myself thinking about ministry or community needs even when I am visiting with people. Questions pop into my head like, "Did I send that email?" or "What was I going to pick up from the store today?" However, none of us allowed any distractions that night. I could probably count on one hand the number of times I have experienced timelessness like that, and that was one of them. Jesus spent a lot of time with His disciples. Sometimes He was preaching and teaching, but often times we read about Him eating with people. He spent a lot of time just being with them, and why? Why do we spend time with anyone? We spend time with people to show we care. It's part of how we love each other. Sometimes we visit our family and friends because they're sick; sometimes we visit for special occasions and holidays; other times we visit because we are saying goodbye. No matter the reason, our desire to be with that person or those people comes from our love for them and thus we are able to give them a glimpse of God's love for them. Any time God's love is involved, it's a prayer. Prayer sometimes involves teaching. It is one of the spiritual works of mercy after all, not to mention one of Jesus's greatest gifts, so it should come as no surprise that I also encountered prayer when I was teaching. One of my most powerful experiences of prayer actually came when I was watching my students pray. I taught Theology 12 for four years in a row, so I had the opportunity to introduce different forms of prayer when the curriculum allowed it. On this particular day, I had introduced lectio divina as a way to pray with Scripture. I had never heard of it before entering religious life, but when I became a novice in community, we would pray lectio divina together every Friday and I came to really enjoy it. It's a prayer typically done in small groups, but for the sake of time, I had my students do their practice run using a journal. Rather than sharing their findings aloud, they wrote them down. It was a very quiet activity, but I had a lot of introverts in the class so I knew it would work out just fine. At one point, while they were jotting down their personal messages from Scripture, it was like everything in me stopped and focused on one simple truth: this was a holy moment. I must admit that I have a terrible memory and have forgotten many special moments throughout my life, but this one hasn't left me. As I watched them journal I knew that it was a spiritually decisive moment - like some of their souls were choosing God right then and would never be the same. Just like we don't receive all of our nutrients from one type of fruit or vegetable, the prayer of sacrifice and the prayer we find in relationships are not the only types of prayer that bring sustenance to our souls. There are various types of formal prayer that also have the power to transform us and therefore the world around us. Getting to know God and ourselves better has the potential to again remind us of who we are called to be - perfect, like our Heavenly Father. Scripture is one of the best ways we can do this, but lectio divina is not the only way to pray with Scripture. Mass and the rosary are two other excellent examples of formal prayers that can enrich our lives with Scripture. Praying with lectio divina has helped me discover areas of my life that I didn't realize needed healing, and has consequently helped me find the path to wholeness. The transformation that took place within me as a result has enabled me to love God, myself and others more deeply. My experience on pilgrimage had never been as rich as it was this year. What changed? I did. My love for dance had never been meaningful before religious life. What changed? I did. Again, prayer has the power to transform us. It's the tool that chisels us into God's image and likeness throughout our entire lives, enabling us to act justly, love tenderly, and walk humbly with our God (Micah 6:8). Prayer is the journey toward perfection. I have always loved animals. It probably helps that as a child my family always had at least one pet in the house. From cats to birds to dogs to hamsters, my mom was the best when it came to bringing us furry friends to love. I loved them all, but of course there was nothing quite like having a dog. We had more dogs than any other type of pet. Their loyalty was healing and their shenanigans made my sister and I look all the more innocent. We had dogs from the pound, dogs from friends, dogs from family members, dogs from all over. We hardly ever turned one away. In fact, I don't think we ever did. That must explain why when I've had to, it's been a fairly painful experience. This year I am preparing to walk a one hundred mile pilgrimage that I walked a few times several years ago. It's a beautiful and graced experience, and I would recommend it to anyone. This particular pilgrimage takes place across New Mexico over a period of almost one week. Getting to know the women I walk with and receiving the love of those who feed and house us has always been spiritual nourishment. On occasion, stray dogs walk along with the pilgrims, and sometimes even go home with them if the owners cannot be found. As you might imagine, I was ecstatic when a dog joined our group during one of the years I walked. The lovely little dog that followed us had many names since almost every one of us chose a name for her. We decorated her with a bandana around her neck and she wore it proudly, never scratching or pawing at it. When we had to stop along our path for breaks and she was not allowed inside, she would wait patiently outside. During our longer stops, many of us wondered if she'd stick around or not, and we'd eagerly go back outside when the break was over to see if she was there. To our surprise and absolute pleasure, she always was. She followed us twenty whole miles the first day, and when we had to retire for the night, we worried about where she'd go or if she'd be there when we woke up. We prayed for our faithful companion and anxiously waited for the answers morning would bring. Morning brought answers indeed, and our little friend of many names was still there. We rejoiced and the journey continued. She followed us another twenty miles, but at the end of our second day's walk, we had to be bussed to the location where we would be sleeping. We assumed our pet could join us for the ride, but that was not the case. The bus driver wouldn't let her on and none of our supply vehicles would agree to take her either. I got on the bus and never cried so hard in my young adult life. I couldn't even stand to look out the window, but was later told that the dog didn't know what to do. She would turn in a circle, look at the bus, and circle around herself again. I don't even remember hearing if she tried following us or not, but I couldn't bear it. We'd taken a dog forty miles away from home and then abandoned her. Even as I write about the experience now it makes me cry. My family had never turned a dog away, and for the first time I was leaving behind a little companion I'd grown to love. I try to avoid thinking about this story because I cry every time I recall the event. However, I could not help but return to ponder its meaning because I had a dream recently which reminded me of it. I dreamt that I was ministering with a group of Sisters. We were at a hospital, visiting and praying with people, and one of the Sisters had her dog with her. The dog was not allowed into the people's rooms, so she told it to sit and stay each time we came to a different corridor, and it obediently did so. At some point a dog came in from outside and began following me around. I enjoyed its company, but it was not as obedient as the other dog. It would never sit or stay when I told it to. Instead, I had to close and re-open the doors to each hallway whenever I made my way around to the different wings of the hospital. It was a lot of work and it began to slow me down. I couldn't keep up with the Sisters or with my ministry obligations. I didn't know what else to do, so as much as I didn't want to, I decided to send the pup back outside. Its company was no longer a luxury I could afford. The title of this blog is “Closing Doors" because as we enter a new year, there are some doors I'll be closing. Most often the new year is associated with resolutions and exciting new plans. For me, the new beginnings that await are ushered in by an ending. As much as I love dogs, I've had much more amazing people friends. They have made the greatest companions I'll ever know and have impacted my life with great peace and joy. I have a small circle of close friends, and most of them remain. Some have drifted out, as happens over time, but this is the first time I've ever had to choose to close the door on a friendship. It feels like a great loss. It feels like abandoning someone who's walked countless miles with you, or like choosing to shut someone out whose company was worth more than a thousand perfect days. If I felt like I had any other choice, I wouldn't close those doors. But I have to. I'm spending all my energy on opening and closing doors and it's slowing me down. I open myself up for the sake of the friendship, and then I have to close myself back up in order to guard against its instability. It doesn't change how much I care about my friend. My friend may never even know how valuable they were and still are to me, but their happiness and my happiness are equally important. Please continue to pray for me as I pray for each of you. May all your friendships, all your relationships, all your beginnings, and even all your endings be abundantly blessed throughout 2017. Happy New Year, my friends.